I have owned mastiff breeds for over 10 years now. these types of dog have been bred to very quickly work defensively and to be wary of strangers. Unfortunately, this causes a lot of us to accept behaviours in our dogs which we shouldn’t. Well socialised dogs should be friendly or at least neutral to strangers and friendly or at a minimum tolerant of other dogs. We manned the Discover Dogs stand at Crufts five or six times with our girl Kitty until she died last year. DD, for those who don’t know, is one of the most popular parts of Crufts among the general public who visit. Hundreds of individual breeds are represented and it’s purpose is for owners to educate the public about their breeds. During my time with Neapolitans, and at DD, I have heard many “gems” of wisdom from owners and breeders about these dogs. One guy proudly boasted that his male NM could stand strangers and was anchored in his garden with two heavy chains and that he couldn’t take his dog out in public or have anyone pet his dog. This unfortunately plays into the bad boy image of the breed and makes them prizes for status dog seekers. My journey into behaviour was hastened by my use of metal collars on Kitty and Bosco and my subscription to the notion of pack theory. In my ignorance and inexperienced, I effectively trained both my dogs to be react to other dogs. It took us seven months to get Kitty used to other dogs to the point she would play with them. She was extremely reactive to other dogs and I was then able to use her as a stooge dog a few years later with dogs I was working with and her dog-dog communication skills became excellent. In her later years, she became increasingly wary of strangers in general and specifically people walking past the property. We continued to work on this not only because it’s the right thing for the public but also because it reduced her stress levels and in return would increase her life expectancy. Reactive dogs are stressed dogs and stress causes illness and an decreased life expectancy. Some breeders unfortunately play a role in this. Many have been breeding for so long and giving the same flawed behaviour advice that it has become gospel within the breed. Breeders are experts on breeding but most know little or nothing about behaviour. I don’t give breeding advice because I don’t know enough about it and I don’t think breeders should give behavioural advice. Within any breed you can have the super friendly, easy going, well adjusted, pleasure to own dog. Our dogs can be like Labrador and goldens, it might just take a ton more work and a much more proactive approach on our part. They can be fit and active and well trained. It’s just more work on our part. Proper proactive socialisation and a shed load of classical conditioning are in order. We don’t need to accept that border collies stalk and chase cars, Akitas aren’t friendly with strangers and Staffordshire Bull Terriers can’t get on with other dogs. I worked with a couple last week who had read on a border collie forum that you can’t get border collies not to chase cars. Maybe the author of the post couldn’t but we did. It took about 30 minutes by redirecting the dog’s focus onto a ball on a rope. the couple need to practice the behaviour with loads of work but we did the “impossible” in 30 minutes. I don’t say this to brag or boast, just to illustrate what is achievable within a little time and with a little knowledge. I looked after a friend’s dog this weekend. 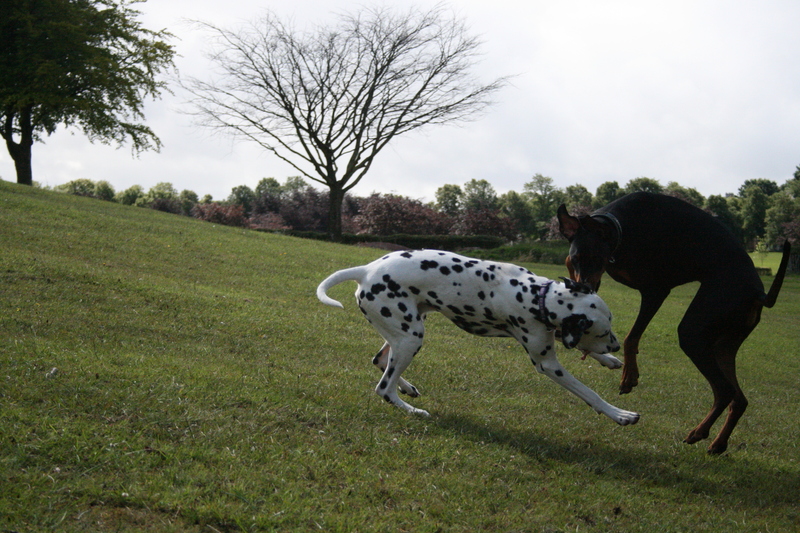 He is a big friendly Dobermann and his social skills with other dogs are excellent. Since Katie got him, she has done the work, asked the questions, read loads and implemented it straight away. This dog doesn’t react to other dogs even when they show aggression towards him. He’s a dobermann, a so called “devil dog” by the press. He was a pleasure to look after and I imagine is a pleasure to own. Don’t settle for breed stereotypes. You owe it to yourselves and your dogs. There are a huge number of applications for Kong dog toys. I often recommend them for training as there are a variety of things your dog cannot do when chewing from a Kong. Your dog cannot bark, lunge, growl, stare at anything else or jump up when chewing a Kong. I recently worked with a young, shy, under-socialised gundog who the owner wanted to take him to dog friendly cafes and pubs. I recommended feeding the dog from a Kong almost exclusively to get the dog addicted to chewing a Kong. Any behaviour which is reinforced will increase in frequency, duration or intensity and if your dog plays with or chews a Kong and gets food from it, this will reinforce the chewing or playing but we must start out with the dog being able to get the food from the Kong. If we make the Kong too challenging to start, the dog will get fed up as he the pay off isn’t enough and the training won’t work. We teach the dog to chew from the Kong when we are there. This means we are able to supervise the dog and make sure he can use it safely. I will explain the protocol I would use for using Kongs with a nervous dog so that the dog can enjoy being out in dog friendly premises. First, teach the dog to chew the Kong using the steps followed in the YouTube clip when you are at home and the dogs is supervised. Gradually build the difficulty so that the dog is able to chew the Kong stuffed with moistened kibble, partially frozen moistened kibble and finally fully frozen moistened kibble. Once the dog is addicted to chewing a Kong, you can then increase the level of reward as you go out into scary places. Next take the dog to a quiet pub or cafe, with only a few people in it. Give the dog a Kong stuffed with kibble and a few extra bits of something really tasty such as cheese or pieces of hotdog. Let the dog become accustomed to being in the new place with the better Kong. Once the dog is used to being in that place, take him to another place which is slightly busier. Repeat the process but have a few more tasty treats in the Kong. Scarier place means better Kongs. Repeat this process for the next, busier pub/cafe, then start again. On the next series of trials, you should hopefully get to another pub/cafe which is busier than the last. It is important to back off and start from the beginning and do your training in “waves”. This way you are not pushing the dog to improve each time, but gradually improving then backing off, improving a bit more, backing off again and so on. When you get to really intense places for the dog, give the dog a Kong stuffed with moistened kibble, pieces of cheese, hot dog, deli meat and lined with peanut butter or cream cheese. The scariest places mean the best Kongs. This process would be done over weeks or months. Go at the dog’s pace, pushing him just a little to improve but not so much that he’ll shut down or lapse. Finally, as part of the treatment for separation distress/anxiety, teach the dog to chew the Kong when you are in the room, then gradually further and further away in the same room, then a little out the room, then gradually further away etc until he is in one room and you are in the other. Then give him a stuffed Kong and go out the house for a few seconds and gradually increase the time you are out the house, again using the “waves” approach.